Free Blue Botanical Flower Download! Today I’m sharing this Free Blue Botanical Flower Download! This is a lovely Antique Floral Drawing, showing some bright blue delicate blossoms, on a some what prickly looking stem, with green leaves. I love the details on these early illustrations. This would look so pretty on some Handmade Notecards or Stationery! Vintage Lady with Tousled Hair Portrait Image! Vintage Portrait of Stunning Strawberry Blond Child Image! Vintage Prickly Flowering Cactus Botanical Graphic! « Art Alchemy Metallique Wax Tutorial! 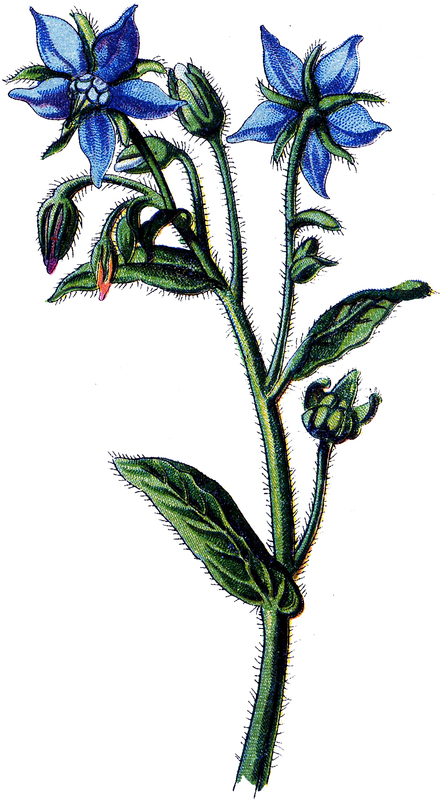 This is borage, or starflower, a herb used for cooking. Beautiful image! Thank you so very much!